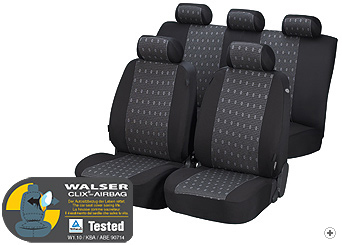 We source seat covers from a range of manufacturers but, as UK distributor for Walser, one of Europe's premier manufacturers, we recommend their products where available. Walser are based in Austria, between the ski resorts of the Vorarlberg and the Bodensee, and make top quality products - well designed, well cut, well made, very well priced. 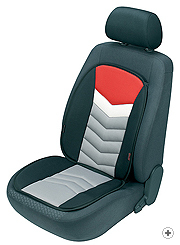 They're also innovative, pioneering new developments in seat cover design to keep up with developments in car safety. The most important of these is their patented Clix III side airbag system details below - allowing Walser seat covers to be used on cars with side airbags, where specifically approved. 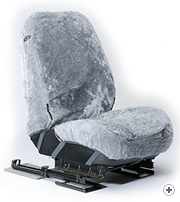 Clix III is incorporated in almost all the seat covers we sell. You'll know that seat covers make a significant difference to keeping your car seats clean and tidy, and therefore to resale values. The most expensive universal sets we sell are around the £40 mark, so if you keep your car for say three years that's an investment of only 3.6 pence a day, which looks like a “No brainer”! Side airbags are the norm nowadays. Approximately one in four accidents is a side collision, but the probability of serious injury and death is twice as high as it is with front or rear collisions, due to the narrow space between passenger and door. 5 ms (millionths of a second) after a crash the sensors will trigger the airbag. 10 ms later the airbag is fully inflated, just in time to protect the passenger who hits the airbag 10 ms later. After another 15 ms the bag starts to deflate. Walser's patented "Clix III" docu-sewing-system emulates the seam in your side airbag seats. Computer controlled equipment measures the thread tension, the thread denier, the thread composition and the stitch length, and if all is well it generates a unique code which is stitched into the front seat covers and recorded by Walser. A Walser Clix III cover is tested on every approved vehicle seat type by TÜV Rheinland, which is a very substantial investment. You'll find a wide range of styles and fabrics, from 'boy racer' to subtler shades, and fabrics that are probably very close to your existing seat fabrics. We also like to carry a range of unusual items, e.g. sheepskin seat covers are warm in cold weather and surprisingly cool in hot weather. Try them! There is a wide range of jacquard and velour car seat covers to choose from, as well as waterproof protective car seat covers to protect your car, and leather seat covers to add a little class. Most of Walser's front seat covers have an almost full-width fabric/leather centre panel and a quality stretch fabric on the sides and back. They are deliberately sold as 'universal', which means that they'll be an excellent fit on a many cars, at least a good fit on most cars, but only an adequate fit on others. There is inevitably some compromise, but Walser have built their enviable reputation by using their knowledge, experience, and technical fabrics to achieve a good fit on almost every occasion. There are also tailored sets of seat covers for certain vehicles – you always need to find your car on our database to see what's available. Front seats are usually subject to more wear and tear than back seats, even on the school run. 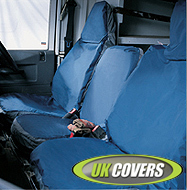 Seat cushions provide quick and effective protection, and they are now also available in Aerotex fabrics. There are always discounts where two seat cushions are purchased at once.